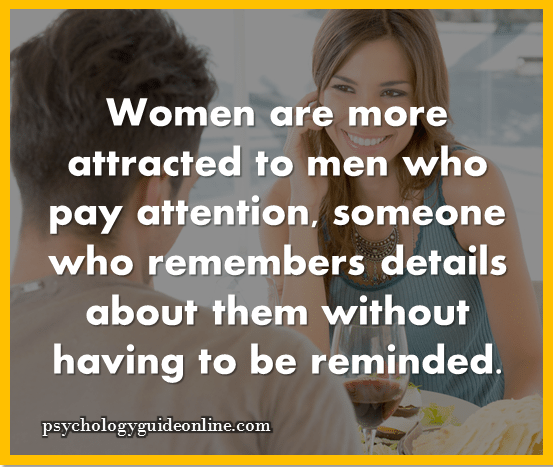 Women are more attracted to men who pay attention, someone who remembers details about them without having to be reminded. Do you find yourself being attracted to some men more than others? you might wonder why your attracted to less attractive guy in the room? Well there is a perfectly good explanation for that women in general are more attracted to guys who pay more attention to them, who see and acknowledge every single thing about them, the way they look, how their dressed and what are their favorite things!!! Yes, all women love the attention they get from a man especially the attention to detail. That’s why even if a man is not the most handsome man in the room or the best dressed we find ourselves drawn to them because of the interest and attention they give us!!! Can a Little Baby Fix a Marriage? Psychological Tips: How to Read Your Professor’s Mind? How Can Rectal Supplements Improve Your Cognitive Skills? We are a team of young professionals and psychology enthusiasts who believe there is a gap between academic psychology and practical applications of psychology in the everyday life of ordinary people. In academic psychology you learn about social psychology, cognitive psychology, physiological psychology, and mental health conditions. Psychology is the study of the brain and its functions and the science of the mind and human behavior. However, most of our society are poorly educated about the applications of these studies in their daily life. We want to fill this gap, or at least shorten it. The articles on this website are written by our staff, special contributors, and guest bloggers. We have the privilege of working with many best-selling authors, motivational speakers, life-coaches, and psychologists who are spending their knowledge, time, and resources to make the life of people, you for example, happier. Powered by inkzine Theme. © 2019 PsychologyGuideOnline. All Rights Reserved.